Support the Mouse, Receive Mouse Merchandise! – Fight Aging! Support the Mouse, Receive Mouse Merchandise! 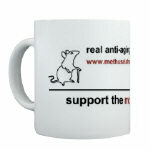 I will be running a special offer for the next few weeks: if you donate to the Methuselah Mouse Prize for anti-aging research, I'll send you Methuselah Mouse merchandise. When you donate, be sure to include your e-mail address and I'll be in touch with you to organize the mailing of your Methuselah Mouse gear. 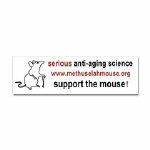 Remember that by supporting the mouse, you are helping to bring real anti-aging therapies that much closer! The Methuselah Mouse Prize is a contest designed to accelerate progress towards real longevity-enhancing medicine, promote public interest and involvement in research on healthy life extension, and encourage more such research by providing a financial incentive to researchers. The prevailing view of the general public is that, despite much-publicised progress in certain areas, we still have no real chance of greatly extending human longevity within the lifetime of anyone alive today. This view may be overly pessimistic. If so, the best way to correct it is to show that the longevity of a laboratory mammal can be greatly increased. This will be especially effective in raising public optimism and interest if the life-extending interventions are only implemented when the mouse has already reached an advanced age, and the prize is partly geared to encouraging such "late-onset" interventions. In less than a year of running, the prize has accumulated more than $400,000 in cash and pledges - far outstripping the first year of public fundraising for the Ansari X Prize back in 1996-7. I think we can all agree that the X Prize has produced impressive results in a few short years. It has attracted more than $160 million in research funding with a $10 million purse, and reinvigorated the private aerospace industry. The Methuselah Mouse Prize is one of the next generation in modern prizes and benefits from recent experience. With your help, I expect it to produce the same spectacular results - in both science and public support - for serious anti-aging science that the X Prize has for space travel. You can read more about research prizes, their history and how they work at the Longevity Meme. Reason - I wanted to be first to get a mug so I can raise a toast to your brilliant efforts! 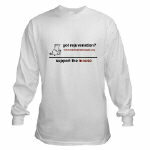 Have you considered sending some free t-shirts or mugs to celebrities, wealthy individuals, or people in the news media? One good mention on the radio, even local radio, might draw a lot of people to the Methuselah Mouse web site. Can you imagine the impact if someone showed up on tv wearing a Methuselah Mouse t-shirt?